The Sandia PV Array Performance Model (SAPM) defines five points on the IV curve. These points are shown in the figure below. where is the vector of coefficients that are determined from module testing. is the short circuit current at reference conditions. can be calculated from (eq. 1) above. is the temperature coefficient for module open circuit voltage at irradiance conditions of . is the fraction of the diffuse light that is used by the module. 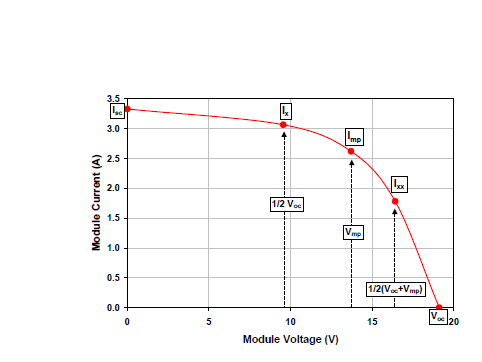 For typical flat plate modules is usually assumed to be equal to 1. For concentrators the value can be smaller than 1.
is a vector of coefficients determined by module testing using a method developed at Sandia.